An elongated crater called "Spirit of St. Louis," with a rock spire in it, dominates a recent scene from the panoramic camera (Pancam) on NASA's Mars Exploration Rover Opportunity.make differences in surface materials more easily visible. In this version of the image, the landscape is presented in false color to make differences in surface materials more easily visible. Opportunity completed its 4,000 Martian day, or sol, of work on Mars on April 26, 2015. 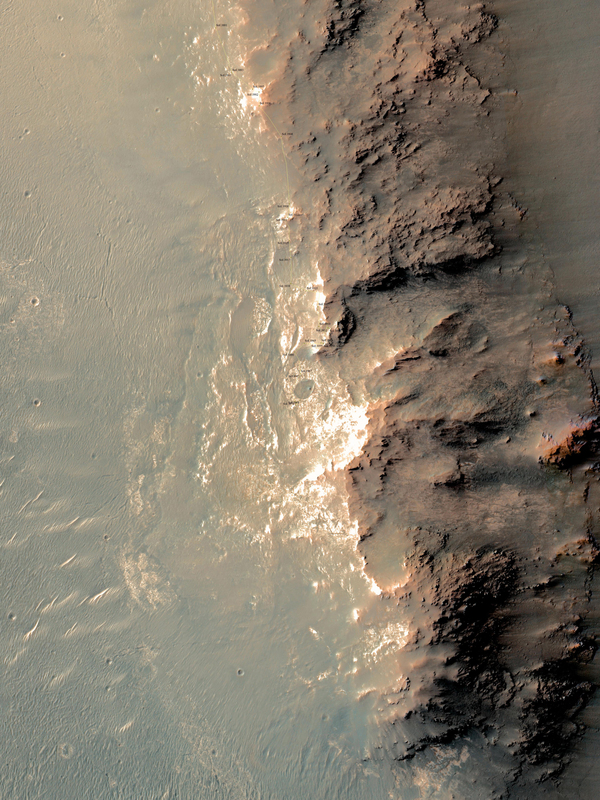 The rover has been exploring Mars since early 2004. The view is centered toward the northeast. The rover's location and the Spirit of Saint Louis Crater are near the center of a map at http://mars.nasa.gov/mer/mission/tm-opportunity/images/MERB_Sol3998_1.jpg. Figure 1 includes labels showing informal names given to some of the features in and near "Spirit of St. Louis Crater," including "Lindbergh Mound" for the spire. Most of the names refer to the first nonstop solo flight across the Atlantic, by Charles Lindbergh, who named his plane Spirit of St. Louis to recognize financial backing for the flight from St. Louis residents including Harold M. Bixby and Harry M. Knight. The plane's designer was Donald A. Hall. The unusually shaped Spirit of St. Louis Crater lies on the outer portion of the western rim of Endeavour Crater. Endeavour spans about 14 miles (22 kilometers) in diameter, and Opportunity has been exploring its western rim for about one-third of the rover's mission, which has lasted more than 11 years. Endeavour's elevated western rim extends northward to the left from Spirit of St. Louis Crater in this scene. A glimpse to the far side of Endeavour is visible on either side of the rock spire. JPL manages the Mars Exploration Rover Project for NASA's Science Mission Directorate in Washington. For more information about Opportunity's mission, visit http://mars.nasa.gov/mer.